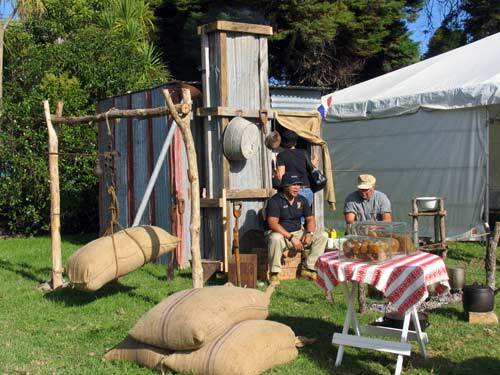 A reconstructed gumdigger's hut, with a pair of diggers yarning outside and samples of gum on a table, were among the attractions at the 2010 Tarara Day. This event, held annually in West Auckland, celebrates the long and friendly association between Māori and the Dalmatian people of Yugoslavia. The Dalmatians first came to New Zealand in the later 19th century, and many worked as kauri gumdiggers in Northland. They often intermarried with Māori, and their descendants, known by the Māori name 'tarara', have a highly regarded place in present-day Māoridom.